Inspired while renovating old Victorian homes, Oliver Arms’ (b. 1970, Arlington, VA) works are characterized by the process in which he builds up and wears down oil paint. His abstract works reflect the tension between man and his experiences. While working in construction, Arms was exposed to the layers of undercoats of paint while sanding down each wall. Applying this same principle to his technique, Arms utilizes different shades and layers of paint, waits for them to dry, and begins his process of sanding with an industrial sand belt to reveal layers of the multitude of colors underneath. 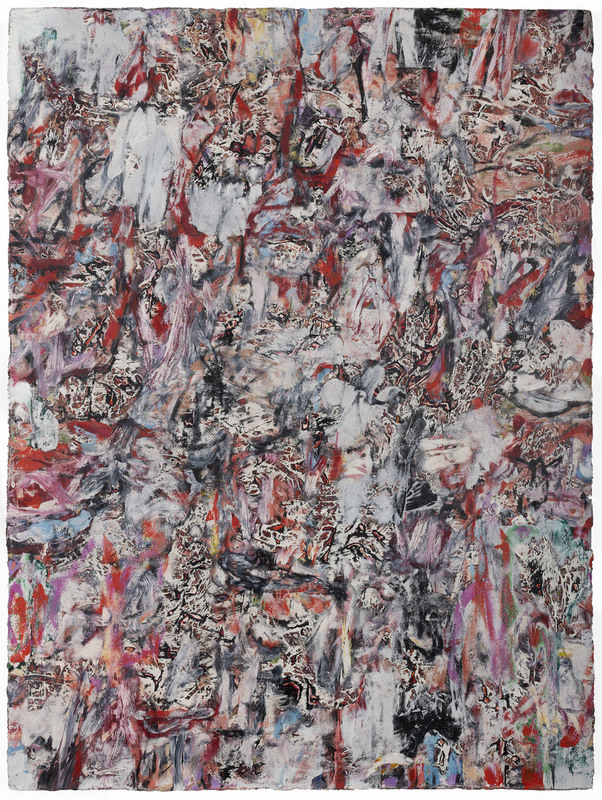 Similar to Jacques Derrida’s theory of Deconstructionism, through his works, Arms explores “how constructs create a dependence on arbitrary components.” In this way, the construction of the final image is interdependent with the “residual effects of time.” Arms builds up layers of paint only to destroy them—to add only to negate. This counterintuitive nature is the characterization of his process, which in turn is the physical evidence of memory. The contrast between the brittle surfaces and the cancerous concentrations of paint evoke a sense of place, people, and time. The specific titles that Arms gives his works “reaffirm, echo, or cement” the emotionally charged essence of his works. His works are creations that perpetually strive to find reconciliation within destruction. Born in 1970 in Arlington, VA, Arms launched his career as an artist with a solo exhibition at Western Project, Los Angeles, CA in 2005, followed by different venues, including the Charles Cowles Gallery, New York, NY and Ameringer/McEnery/Yohe, New York, NY. Arms currently lives and works in Los Angeles, CA. 미국 Arlington, Virginia 주 출신의 작가 올리버 암스(b.1970)는 색의 물리적인 축적과 해체에 천착한다. 캔버스에 다양한 색채의 유화 물감을 바르고 말리는 과정을 반복하여 층층이 쌓아 올린 뒤, 산업용 벨트 샌더를 이용하여 갈아내며 그 양감을 무너뜨리는 동시에 다양한 색채를 드러내며 폭발시키는 것이다. ‘갈아내기’라는 네거티브 행위를 통해 색을 더하고 창조하는 작업 방식이 독특하고 흥미롭다. 이는 작가가 학비 마련을 위해 건설 노동자로 일한 경험에서 연유하는데, 오래된 주택 벽면의 두꺼운 페인트를 갈아내면서 그동안 덧칠된 다양한 색의 페인트가 밑에서부터 피어 오르며 드러나는 과정에 매혹되었다. 그의 작품은 강렬하고 매혹적인 색과 질감이 교차하며 단순한 색채의 아름다움 이상을 보여준다. 하나부터 열까지 오랜 시간을 들여 작가의 손끝에서 드러나는 색의 향연은 그 자체로 시간의 흐름과 영향력에 대한 기록이며, 그의 캔버스가 펼쳐 보이는 것은 형언할 수 없는 색과 감정의 무한한 스펙트럼이다. 올리버 암스는 현재 로스앤젤레스에서 거주하며 활동하고 있다. Western Project 및 Charles Cowles Gallery, Ameringer/McEnery/Yohe에서 개인전 및 다수의 전시에 참가하였다.